Evidence of how Labour and Union figures worked to sabotage the first privately run NHS hospital has been uncovered by journalists Guy Adams and Sophie Borland. The left-biased watchdog Care Quality Commission rated Hinchingbrooke Hospital inadequate only months after it won an award for its patient care: Britain’s best performing hospital, no less. At the speed of lightening it suddenly became the worst, based on unsubstantiated, almost certainly fabricated anecdotes in the war against NHS reform. Patients themselves do not corroborate the report’s “findings”! The local NHS body, which suddenly slashed the hospital’s funding and, soviet style, imposed arbitrary fines, is overwhelmingly influenced by Labour activists. Agenda writ large. This is the very same watchdog which failed to prevent horrific scandals in other hospitals and care homes. Its chief inspector of hospitals at CQC is Sir Mike Richards who is either an incompetent fool or a more sinister servant who should be stripped of his knighthood. As a result of the militant negativity of the CQC, the private provider, Circle, judged the setup unworkable, got cold feet, and withdrew its contract.Consequently, the hospital was placed in special measures and threatened with closure. Round one to the Unions, as their victory cheers drown out the cries of their patients and staff. But patient care has never been the first priority of socialists, who use any instruments at hand to prosecute their revolution. Scratch the surface and the same indulgently tolerated “enemy within” can be uncovered inside other unionised bodies: teaching unions, police unions, church ivory towers and university common rooms. Plebgate shocked a public who have been lulled into trusting the British Bobby to protect them from wrongdoers. But the Met seethes with hatred of a government which has stood up to its over mighty powers, determinedly taking steps to reform and streamline an ever-changing monolithic “security” monopoly. Vested interests to not relinquish their surreptitiously acquired feather beds without a bitter struggle. If London police authorities had the audacity to conspire to bring down an elected member of the government cabinet, with what confident disdain might they feel free to trample the lives of the less powerful? From doctors to dogs, Unions to Charities, governments must wage an unending war on cynical exploitation of safe havens. 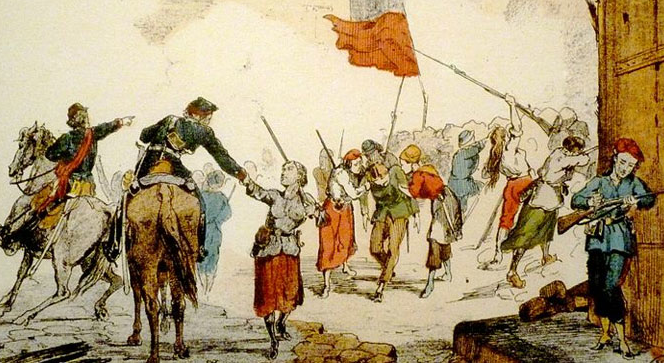 The British nation only narrowly avoided the horrors of the French Revolution, whose mob reign was not dubbed “The Terror” without good reason. The red flag does not fit comfortably anywhere, not even today in republican Paris.